I love words, and teachers should. It’s contagious. I started this year by revealing a largely kept secret to my students. I built up the excitement in the classroom by asking them in a very facetious manner if they’d like to know a secret about me. Naturally, their eyes twinkled like Christmas lights, and smiles crept across their faces. I’m not sure why, but they were very enticed by the fact that I was about to reveal a secret to them. Their smiles immediately vanished, the twinkling stopped, and they realized that my secret was, in fact, a dorky teacher secret. It is, however, the truth. I love words, and teachers should. However, I didn’t always. In fact, I don’t think I really began to love reading until college when I took a children’s literature class, taught by Mrs. Janice Sherbert, a perky and passionate adjunct whose love for children’s books was contagious. However, it was not until my first year teaching that I really began to discover the magic of words. Words are like small puzzles, and I love puzzles. If you can understand the parts, you can unlock meanings, see the “bigger picture,” and even sometimes get a small history lesson in the process. However, our students do not realize this. Slowly over the past few months, my students have started to gain a similar passion for words. Well, maybe “passion” isn’t the right word to use, but they are picking up on the importance. After this trained heightened sense of awareness, they consistently clap for word wall words and parts of words we’ve studied thus far. One of the biggest challenges, however, with teaching vocabulary is doing it authentically. There are countless programs that provide structured lessons on vocabulary, many of which help students succeed on standardized tests. However, very few programs train the students to actually use the words flexibly, to the point of easy recall in speech or writing–this is where the teacher comes in. Much to the surprise of many, the program can never do the teaching. In the words of Marzano, it is the teacher who plays the most integral role in the success of a child. The Words Their Way program, I find is one of the more authentic programs, as it, in the very least, asks the kids to make some meaning through sorting. However, even this can be a passive activity. Take, for instance, one of the sorts for root words or suffixes. One of the lessons, I believe, requires the students to sort words containing port (carry) and geo (earth). While sorting is wonderful for sounds and letter patterns, sorting between port and geo requires only visual cues and does not require the students to use the definition of the root words in order to sort. It is for this reason that I’ve decided to supplement the Words Their Way program with some other activities to help them grasp these a bit more. (1) Embedded Instruction – I think the most effective manner to impart this sense of words on students is to continuously find and explore words in the text you are reading. Almost every day, I try to either plan words that I’m going to discuss with my students, or encourage them to find words that they do not know. In some cases, I like to give them specific word parts to hunt for. Just the other day, in an effort to collect words ending in -ous, I had them clap every time they heard the ending. Granted, it was only a couple of times in that specific lesson, but it was a great way to authentically find the words and discuss their meaning. This also opens the door to words that have similar letter patterns, but do not function as prefixes, suffixes, or root words. (2) Student-Created Word Sorts – GoogleDocs has really revolutionized my teaching. Granted, a device is very helpful when using Google Applications, but it is not completely necessary. This activity, in particular, could have most likely been achieved by merely using a computer set up at a station. Anyway, in an effort to help the kids seek out certain words on their own, I’ve had my students go on word hunts. In these word hunts, they find words in their independent reading, magazines, and other print sources. While this, in and of itself, is not a novel idea, I extended it by having them input these words into a Google Form. This collected the words automatically for me, and I was, then, able to create word sorts out of this. Many students would find words that had the letter patterns within the word, but it did not act as the designated suffix, prefix, or root word. This provided a much more thought-provoking discussion than one of the Words Their Way sorts that relies only on visual cues. In this case, visual cues are of no assistance. It is essential to know the meaning of the word part, as well as other parts of the word, to truly see if the part of the word is acting as a prefix, suffix, or root word. 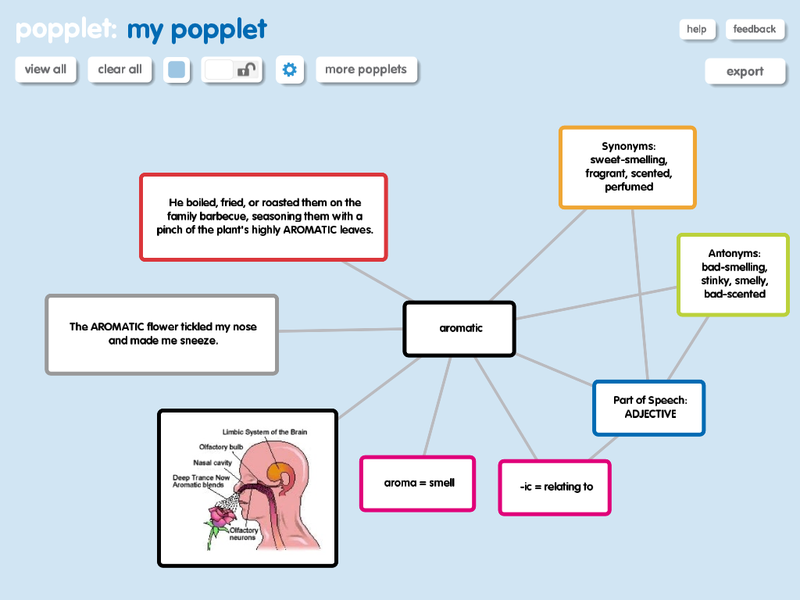 (4) Vocabulary Popplets – When first trying to conquer vocabulary, I used the Frayer Model, in an effort to help provide more context when defining a word. One of my biggest pet peeves is when students immediately consult a dictionary for the definition of a word, when they can, oftentimes, begin defining the word by merely using context clues. However, even when that fails, I still prefer them to not use the dictionary, because oftentimes the definition is more incomprehensible than the word itself! 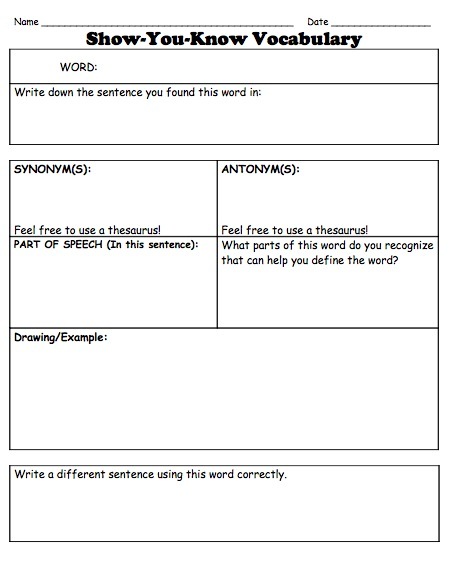 After grappling with this, I decided to develop a new worksheet for vocabulary, which used components of the Frayer Model, but also incorporated context clues, synonyms, antonyms, word parts, and of course, a new sentence through which the students could show the depth of their understanding of the new word. I called it “Show-You-Know” Vocabulary (see Figure 1), because they were truly trying to find any way in which they could demonstrate their understanding of the word. With the recent 1:1 additions into my classroom, I’ve found an even more interactive way to give my students all of the much needed exposures to new words. I’ve turned the Show-You-Know Vocabulary into a concept map where they can include all the components of a Show-You-Know worksheet, while making other connections, as well. (5) Vocabulationary – This is another Mr. France original. This game, similar to the word puzzles, I use so the students have more exposures and a chance to “play” with the words. I once read, forgive me for not citing, that word play was one of the cornerstones of vocabulary instruction. Kids need multiple exposures and the chance to “try on” words in order to see how they fit into their oral and written vocabulary. “Vocabulationary” functions as such: They begin by choosing a rule for their current round. The rule could be anything: They could list antonyms, list synonyms, create sentences, provide examples… whatever they’d like. However, everyone must follow the same rule. Students then use a Vocabulationary game board created by the teacher. They roll the dice. After rolling, they move the allotted amount of spaces, where they land on a color. Each color corresponds to a certain part of speech, and each color has a stack of cards that accompanies it. When they land on the color, they choose a card from the corresponding deck, which also happens to correspond to the part of speech. When they pick up the card, they will see a word that falls within that part of speech (and also a word that comes from the word wall). Then, they have to follow the rule they chose before the game started. If they follow the rule correctly, they are allowed to stay in the spot to which they moved. If they do not, they move back to their original spot. While it is not about the winning, it definitely motivates them to try their best and respond correctly! Providing these many games and activities allows for a differentiated and fun atmosphere for building a sense of words. Note, the goal of these activities is never to only learn specific words or esoteric terms that they will only use in limited areas. Rather, these activities are intended to build strategies for understanding words by breaking them down and analyzing their use. It helps that they are able to have fun along the way!